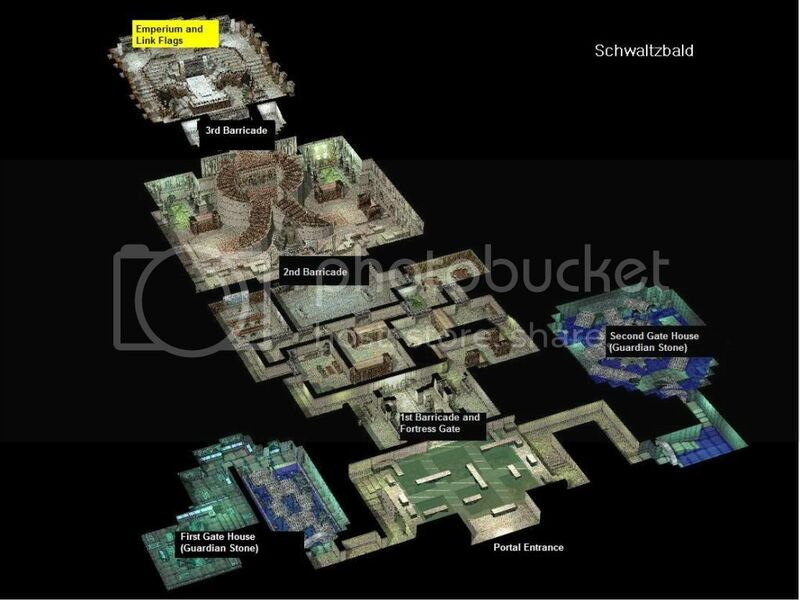 This is a picture of the Schwaltzbald, the layout is basically the same for all 2.0 castles. The Barricades are impervious to harm (undamage-able) so the goal is to break the enemy's "Guardian Stones." Once the Guardian Stones are both destroyed the barricades are damage-able. The Stones and barricades take normal damage from normal skills. You must break the barricades to get to the Emperium. Once the last barricade falls you will have access to the emperium room. famiong wrote: Any guild member can create/repair the Guardian Stone. Make sure these items are in your inventory when talking to the NPC. famiong wrote: They too can be repaired/created, but only by the Guild Leader of the guild controlling the castle. Make sure these items are in your inventory when talking to the NPC (Control Device).